For the first time in my life, I have an actual shot at being someone at school. I’ve always been more of a Queen B than a Queen Bee—you know, B as in not A. Second tier. (Fine, if you have to get technical, sometimes even lower.) But this year, out of nowhere, I have a chance to be a real Queen Bee. Not that I intend to be snobby, or cliquish, or any of the other rude things sometimes stapled to that label. I just want people to love me. 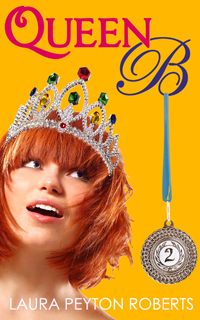 Cassie Howard has been second best all her life, but as Snow Queen runner-up—with a cute new boyfriend, to boot—she’s determined to reach new social heights this semester. The time has come to move from Queen B to Queen Bee. But how is she supposed to fly when life keeps pinching her wings? Her lovesick brother is determined to mortify her in public. She’s in charge of her school’s talentless talent show, where at any moment someone could pull back the curtain and expose her (many) insecurities. The people she cares about most are mad at her. (Again.) And her nemesis, Sterling, has an evil new clone, one who’s making a hobby of humiliating Cassie—and making a beeline for Kevin. Does being popular mean you have to sting like a bee? Or can a girl become queen without losing her honey?